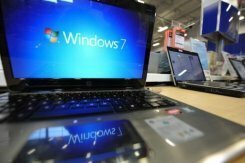 IT giant Microsoft on Wednesday delivered its answer to Google and Apple, through a new-generation Windows operating system designed to run seamlessly on computers and portable tablet devices. “Windows 8 is a generational change in the Windows operating system,” said Windows president Steven Sinofsky. “It’s Windows reimagined,” he added, launching the consumer preview of the operating system at the world’s biggest mobile fair in Barcelona. The operating system is Microsoft’s riposte to Google’s Android platform and Apple, which has dominated the tablet market it ignited with the release of the iPad. Like its two competitors, Microsoft is adopting the “app” style in its reinvented operating system. Unlike previous generations of Windows, which has a taskbar pulling up a list of software, the latest version has a selection of applications or “apps” tiled on the start page. For devices with touchscreens, apps are selected or moved around in the same way as on a smartphone — by hand, swiping to switch between pages or screens, pinching to enlarge or shrink and tapping to select. For those without touchscreens, the same could be done using the drag and drop functions, or clicks of a mouse. “Apps bring to life the operating system. The more apps you have, the better your experience,” said Sinofsky. For those who have several devices, they will be connected through a “cloud”, a resource that pools a user’s data online rather than on a user’s computer disc. “This connection through cloud is very important in how we thought of Windows 8 in the beginning,” said Sinofsky. It enabled what is seen on the screen of a tablet device to be replicated on a regular computer if the user signs in with a Windows ID. Microsoft also announced on Wednesday the test opening of its Windows Store, where users can buy apps online. Although it is a heavyweight in the computer market, Microsoft has lagged behind in getting a share of the smartphone and tablet pie. Windows has teamed up with Finnish giant Nokia to make smartphones to try to win back a share. On Monday, Nokia announced that Windows phones have now been made compatible with Chinese mobile operating networks, allowing it to bring its smartphones to that massive market. It could also challenge the dominance of Blackberry in the corporate market, as companies may opt to go with Windows as their computers are already running on that operating system. “We have a wild card on this subject because we are very active in enterprises’ IT systems” and companies “realise that it would provide better integration and a better experience,” Microsoft’s mobility division director Laurent Schloesser told AFP. “The enterprise market will take up Windows Phone,” he added. Gartner research analyst Roberta Cozza said that it remained unclear how Windows 8 would be integrated with the Windows phone. “But it will definitely make the user interface (UI) that we have seen today more familiar with consumers. “The tiled UI is new but if it gets adopted on PCs and tablets, it will resonate more and become more familiar to users, and this could in turn help the Windows phone,” she added. The Windows 8 preview is available for download at preview.windows.com. During the preview period, apps on the Windows Store will be available to users to test for free.